The US State Department is considering dropping “democracy” from its key mission statement as Secretary of State Rex Tillersonorders his department to redefine its purpose to the world. The draft statements under review right now are similar to the old mission statement, except for one thing – any mention of promoting democracy is being eliminated. Former senior State Department officials from both parties said eliminating “just” and “democratic” from the State Department’s list of desired outcomes is neither accidental nor inconsequential. The mission statement is important because it sends a signal about American priorities and intentions to foreign governments and people around the world, said Mr Abrams, who was considered by Mr Tillerson for the job of deputy secretary of state but rejected by President Trump. Tom Malinowski, who served as assistant secretary of state for democracy, human rights and labour for the Obama administration, said the new proposed mission statement brings US foreign policy into closer alignment with that of some of America’s chief adversaries, including Russia. Mr Malinowski also predicted that the change, if it becomes permanent, would sow confusion throughout the ranks of the State Department’s civil and foreign service because hundreds of State Department officials work on congressionally funded programmes every day that are meant to promote democracy and justice abroad. Adding to the confusion, Mr Trump occasionally trumpets democracy promotion, for example when it comes to Cuba or Venezuela. But in his inauguration speech, Mr Trump made clear that democracy promotion would not be a feature of his foreign policy. “We do not seek to impose our way of life on anyone, but rather to let it shine as an example for everyone to follow,” Mr Trump said. The changes in the State Department mission statement may not seem very significant viewed in isolation. 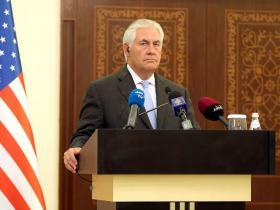 But Mr Tillerson has made several statements and decisions that indicate he plans to lower the priority of democracy and human rights in US foreign policy. In his first speech to his State Department employees, he said promoting American values “creates obstacles” to pursuing America’s national security interests. In March, he broke tradition by declining to appear personally to unveil the State Department’s annual human rights report. In another example, the State Department will soon eliminate the http://www.humanrights.gov website and move its content to an alternative web address, http://www.state.gov/j/drl, a State Department official said. This entry was posted in foreign policy, government, politics and tagged democracy, Donald Trump, Josh Rogin, Rex Tillerson, State Department, The Independent, Washington Post. Bookmark the permalink. 3 Responses to WHO NEEDS DEMOCRACY ANYWAY? Well, I think it might be hypocritical of us to promote democracy abroad, considering that our president lost the popular vote, our Congress has a Republican majority despite Democrats winning more votes, and statistically, ideas favored by the wealthy donors are much more likely to become law than those favored by the majority. You are right on all counts. Still it is an ominous sign that our economic interests trump (pun intended) everything else.